Custom fit to your vehicle, the Magnum Truck Racks offer the best of both worlds. Camping or working, hauling an ATV or the tools of your trade, you won’t find a more all purpose rack. 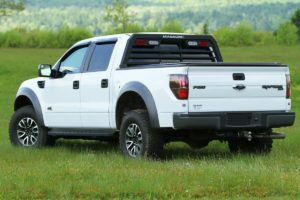 Designed to withstand heat, cold, and anything you can do to it, Magnum’s Racks are mig and tig welded aluminum, powder coated, and compatible with most between the rail tonneau covers. As a tie down or brace, you can be sure your ATVs and dirt bikes will be secure in the bed of your truck when secured to the Magnum Truck Rack. Custom jigs for almost all trucks ensure a tight, stable fit. Whether you choose the High Pro for its taller clearance and Glide Track System, or the barebones Service Body Rack, all of Magnum’s racks come fully customizable with several accessories that make loading and storage a snap. The built in backup, break, and signal lights ensure compliance with traffic laws and stay secure with Magnum’s custom wire harness design. Designed from the ground up to be best in class, contractors will love the rugged and stylish design. Great for anyone who relies on their truck to do their job, the Magnum Truck Rack will quickly become an indispensable part of your business. No matter your choice, the Low Pro, High pro, Standard, Service Body, or Service Body with Lights your sure to have the lightest, toughest, and the best fitting rack on the market. Magnum Truck Rack’s are top of the line, best in class, and still amazingly affordable. For work or play, you simply can’t find a better rack. Hauling your camping gear, your fishing poles, your tool box, or just moving, it can do it all, do it well, and still look great.